Nash from Radio Dead Air did an interview with Aaron during DragonCon 2007. In an interview with White Powdered Doughnuts at DragonCon 2007, Aaron reveals that his episode of REAPER (What about Blob?) is either episode 4 or 5 and he plays a demon. Aaron is interviewed at time stamp: 01:50 – 07:39 in the video below. Battlestar Galactica series is enjoying critical acclaim and viewer ratings like Star Trek hasn’t seen in a generation. What is Galactica doing that is so right? What should Paramount be learning from Galactica’s success? Guests: Lee Stringer, Brent Spiner, Mark A. Sheppard, Charles Root, Carlos Pedraza, Gates McFadden, Richard Hatch, Kevin R. Grazier, Jonathan Frakes, Aaron Douglas, Jamie Bamber. Two Apollos and a Chief Petty Officer walk into a ballroom, wackiness ensues. Guests: Aaron Douglas, Richard Hatch and Jamie Bamber. Another chance to hear our guests from both sides of the Battlestar cameras. Guests: Mark Sheppard, Kevin Grazier, Aaron Douglas, Jamie Bamber and Richard Hatch. Saturday and Sunday Panels by: transplant42 (Bamber Bunny laurie31 and MrBamberrific). 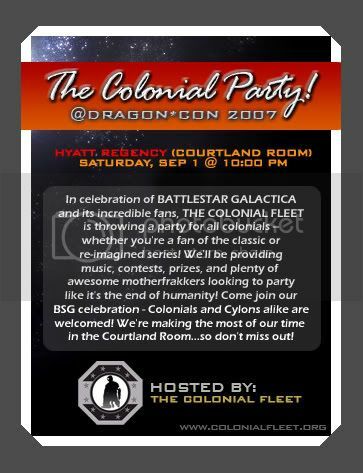 The DragonCon “Pocket Program” has been posted on their website. All of the guest panels (that Aaron is involved with) will be held in Cent. II-III (H). For the newbies, that is the Centennial Ballroom in Rooms II – III at the Hyatt. The Centennial Ballrooms are on the Ballroom Level (one level down from the lobby). Here’s a map http://www.dragoncon.org/pdfs/hotel_floorplan.pdf or there is a close up map of the Ballroom Level on page 72 of the pocket program. Below are the guest panels that Aaron will be attending ……. Aaron is in booth 30. Aaron has not been invited to DragonCon. He wants to attend and he wants your help. Direct quote from Aaron …. “Tell fans to tell DragonCon we want Aaron Douglas there. They are passing on me being there”. When I told him that I just assumed that he would be at DragonCon and that they just hadn’t added his name to the guest list yet, he said “DragonCon passed on me”. I have no idea why or what is going on. But if you are going to DragonCon and want to see Aaron there, please get in contact with DragonCon and let them know. According to the GUEST SERVICES page on the DragonCon website (http://dragoncon.org/dc_guest_services.php) The GUEST SERVICES DIRECTORS are …..
I’m not sure if these are the people we need to email, but it’s a start. Or if you know who we should get in contact with, please reply and let me know and I’ll update this post. And please feel free to copy and paste this post to any BSG message board(s) that you think can help (I’ve already posted this on the Skiffy and Gateworld Aaron/Tyrol threads). UPDATE (August 14th, 2007): A friend (who knows I have limited internet access while I’m away) texted me to say that Katee Sackhoff cancelled DragonCon. I just spoke to Aaron and jokingly commented that with Katee cancelling they should invite him now. He said that Katee and Jamie have both cancelled and that the DragonCon people have called his agent and said that they have listened to Aaron’s fans and they really want him to be at DragonCon and they’re going to do whatever it takes to get him there last minute. Aaron asked me to pass on a huge thank you to everyone that contacted DragonCon and asked that he be invited. It’s not official yet that he is going because his agent is still in negotiations with DragonCon but it’s looking really good. I’ve asked him to let me know once it’s official so I can let you guys know (or keep checking the DragonCon website to see if his name has been added). UPDATE (August 15th, 2007): Just heard from Aaron that he is officially going to DragonCon!!!!!! Thank you to everyone for their help in getting him there. UPDATE (August 16th, 2007): Aaron said that the guy responsible for getting him to DragonCon is Pat Henry. I just went and looked him up on the DragonCon website and found his email address and I thought it would be really great if we all emailed Pat to thank him. His email address is phenry @ mylink .net (remove the spaces). Edit: Sorry. Probably should have mentioned that Pat is the Chairman (and also the Treasurer) at DragonCon.